The human body can actually prevent vitamin deficiency by manufacturing many of our necessary vitamins, if there is a good supply of quality minerals and a properly functioning digestive tract. However, these vitamins are easily destroyed by food additives and preservatives, use of fluorescent lights, high-stress environments, and pollution. Vitamins are organic compounds found naturally in the foods we consume. They perform crucial functions such as protecting against infections and disease, helping the body’s metabolism, maintaining tissue growth, and waste removal. Vitamins are a lot like building blocks. A healthy body is able to put these blocks together to create the enzymes and hormones that, among other things, control heart rate, blood pressure, glucose levels and other chemical reactions. The recommended daily allowance (RDA) of the various vitamins is the official opinion of the US government, and is different depending on your age and current state of health. Women who are pregnant need a different combination of vitamins to protect the fetus against birth defects and grow a healthy, robust baby. Adult men have different requirements than adult women; children, teenagers and the elderly all have different nutritional requirements. Many of these RDAs are controversial according to nutrition researchers. 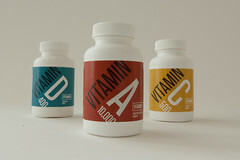 For example, The US RDA for Vitamin C is 60 mg/day for an adult. This is enough to prevent death by scurvy (internal hemorrhage). Needed vitamins are ideally obtained through food; unfortunately, so-called “modern” farming practices have depleted our soils of nutrients. Organic food is far more likely to be nutritious because, as a rule, an organic farmer cares about the health of Earthly beings, and the planet itself, and uses techniques and materials that increase rather than deplete healthy value. Although perhaps not noticeable at first, vitamin deficiency can lead to serious health problems later on. Most people these days don’t eat a nutritionally-balanced diet. In fact, many eat pretty poorly: processed foods, fast food and restaurant food tend to have flavor-enhancers like MSG (mono-sodium glutamate) to cover the lack of quality (and nutrition) and have taken the place of healthy foods. These types of foods also tend to be high in trans-fats, another negative. Thinking about food as a source of fuel is helpful. Give your body the right type of fuel (high octane) and it will perform at optimum capacity. Fuel it with the wrong things, and over time, lines will begin to clog and performance will begin to decline. Because you can’t see what is going on inside the body, it’s difficult to get a good understanding of the negative effects a poor diet can have on your body. It’s usually not until things start falling apart that people take notice- extra weight, lower stamina, problems with depression, sexual dysfunction, skin problems, hormonal imbalances- these are all wake-up calls to trouble that’s been brewing a while. What types of problems are associated with vitamin deficiency? Juvenile acne, arteriosclerosis, tinnitus, eczema, morning sickness, hay fever and allergies, edema, and loss of concentration are all indications of vitamin deficiencies. Insufficient Vitamin D can cause weak or even deformed bones. Lack of Vitamin E can lead to the destruction of red blood cells. Not enough Vitamin C can cause tiredness, weakness, sore muscles and can cause gums to bleed. An overall vitamin deficiency can even lead to death. Vitamin food supplements are a necessity these days; a great way to give your body what it needs for good overall health and to address specific concerns and conditions. Minerals– Mineral deficiency is a big deal. All of our mineral nutrition ultimately comes from the world’s oceans. Bach Flower Remedies– Classified as emotional homeopathics, the Bach Flower Essences help to coax negative symptoms toward their more positive aspects. Quality Supplements at a Discount– Supplements at the prices you want, with service you wouldn’t expect. Native Remedies– The highest of quality natural medicine for your health, professionally formulated in therapeutic dosages.